Since 16 September 2018, the Cochrane Collaboration (www.cochrane.org), today only referred to as Cochrane, has received tremendous attention from experts and general media around the world under the banner "Cochrane in crisis"? Facts are remarkably sparse and extremely contradictory. At the centre of attention is the published criticism of a recent Cochrane Review on HPV vaccination against cervical cancer; the discussion, vote and expulsion of the Nordic Cochrane Centre director from the Governing Board and from Cochrane as the cause of the resignation of four members of the Governing Board; and the subsequent resulting interpretations and assessments. These show an astonishing heterogeneity, mainly due to incomplete information provided by the board. Events are interpreted from the perspective of one's own respective worldview, both on the benevolent and critical side, making understanding the situation from the outside even more difficult. The present events are unpleasant but inevitable evolutionary steps in the growth of such a heterogeneous organization as Cochrane. They will give rise to impulses that are fruitful for further development. Internationally, the current irritations are unlikely to have any long-term negative effects. At national level, the work will not be influenced in any way. A strong Cochrane Germany is called upon to actively influence Cochrane's international development and to remind us of focusing on Cochrane's values and goals. Since the Cochrane Colloquium 2018 (16 - 18 Sept.), Cochrane International has been the subject of confusingly different presentations in scientific journals as well as in public media. Criticism of the content and diverging assessments of a systematic review concerning the HPV vaccination, personal disputes among members of Cochrane and all of this under the framework of the British foundation law are difficult to convey to outsiders, even in a longer version. To make matters more difficult, many assessments are strongly based on subjective assessments, which, especially among the opinion leaders, have been shaped over 25 years by the history of the Cochrane Collaboration. In order to do justice to the question "What's going on with you guys?" that has been thrown at us from all sides, following is a personal statement from me (Gerd Antes). It is limited to the presentation and assessment of the structural conditions and the essential/relevant factors only, without going into details. 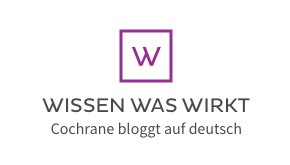 My assessment is based on almost 25 years of experience as a member of the organization (including membership of the Steering Group and as director of the German Cochrane Center, formal registration at the end of 1997). Cochrane (original name: The Cochrane Collaboration) is a global network founded in 1993, whose intellectual foundation was laid in 1972 by Archie Cochrane's book. A glance at this time period offers a fascinating lesson, from the development of the fundamental and overdue idea (statements on effectiveness from controlled studies) to a mature organization. After two decades of methodological development work, the next 25 years witnessed the development of a Grass-Root movement into a professionalized Cochrane organization with the Agenda 2020. To put it succinctly, this means the profound change from a rapidly growing group of scientific individualists to an increasingly centralistic and also partly authoritarian-seeming organization. Cochrane's development is a fascinating success story, as the simple idea of generating and applying medical knowledge by synthesizing the results of controlled studies has spread across most of the world with different political systems (in over 130 countries), fundamentally different health systems, and an almost unsurpassable diversity of social systems, cultures, and religions. The relevance of this work has been recognized, among others, by a seat in the World Health Assembly in 2011. These successes are visible and measurable through very high numbers of citations, e.g. in evidence-based clinical guidelines, thereby making Cochrane provide a central foundation for external evidence in evidence-based health care. Another dimension of this success story is largely invisible as long as it continues to function. The structuring and functioning of the governing and steering bodies of such a heterogeneous organisation is indeed one of Cochrane's great achievements, as these structures have been developed under tensions of various kinds during its 25 years of growth. The success achieved so far is being pushed into the background by the current events, which have occurred for the first time in this form, and which have reached the public and above all, are perceived as a threat by Cochrane. The situation has a very complex background, but can be simplified: Cochrane has a so-called Governing Board as its steering group, which makes strategic decisions under the leadership of two co-chairs. In addition, there is a CEO for operational business and a Chief Editor responsible for the contents of the Cochrane Library, who both lead the business with professional employees in London. The Governing Board's agenda for the meeting before the Cochrane Colloquium included a discussion on the behaviour of Peter Gøtzsche (Head of the Nordic Cochrane Centre, Copenhagen) and the potential damage to the reputation of the Cochrane organisation resulting from it. The main reason being the massive criticism of a recently completed Cochrane Review on HPV vaccination for the prevention of cervical cancer in the British Medical Journal (Lars Jørgensen, Peter Gøtzsche, Tom Jefferson), with the first two authors belonging to the Nordic Cochrane Centre. Obviously this was only a small part of the accusations, so the discussion in the Governing Board ended with a vote on the question whether Gøtzsche should be excluded from the Cochrane organisation. In order to understand the implications of this vote, a few facts about Gøtzsche should be mentioned: With the Nordic Cochrane Centre, Gøtzsche belonged to the first group of centres founded in 1993. In relation to Denmark's population, the centre is by far the best and most sustainably equipped centre. Gøtzsche has published a wealth of articles and books analysing and commenting on many controversial topics in today's health research and health care. The approach shown was almost always characterised by directness and uncompromising behaviour and formulations that were polarising and had and still have strong effects on the perception of Cochrane. Gøtzsche thus on one hand embodies Cochrane's loyalty to principles, unyieldingness and integrity, but on the other hand a lack of diplomatic, connecting communication and appropriate collegial interaction, especially within Cochrane. The manner of criticism has been deplored over many years, especially by Cochrane authors and the publishers/editors of the review groups. These two sides, made visible by Gøtzsche, are found in non-quantifiable form in Cochrane and are a decisive reason for the current situation. Against this background, the question arises as to how Cochrane as an organisation deals with such members. The Board's approach seems inappropriate given the more than 25-year history of Cochrane's engagement with Gøtzsche. The development before this discussion and vote was not transparent and lacked essential information. This is being justified by the notion that during the ongoing process the foundation law of Great Britain, with the Charity Commission as the supervisory authority and legal advisor, stands above everything else and therefore confidentiality had to be maintained. With this, the Board confirms in a damaging manner the allegations that Cochrane is moving away from its goals and undermining basic principles such as transparency and integrity at the governance level. In this light, the resignation of the four members seems, from my personal point of view, not only to be a well-founded discretionary decision, but also a clear commitment to Cochrane's fundamental principles, and therefore almost a mandatory one. It was to be predicted that Cochrane would be damaged by this discussion, vote and narrow majority decision within Cochrane itself and in the external perception. In addition, according to the rules for the board's work, the decision against Gøtzsche would have to be represented in public by board members, which seems difficult on the basis of the overall constellation outlined above. From a German perspective (similar for Austria) two crucial questions need to be answered: Will the current conflicts have long-term consequences and will they have an influence on the national and local work in the short and medium term? The former will depend on how the current situation is resolved. The question "Cochrane in crisis?" must be answered by stating that Cochrane has a governance crisis. This is not precisely predictable, but also not really surprising, given the rapid growth from its foundation to an indispensable global platform for reliable medical information within 25 years. The goal should now be to perceive the events as an evolutionary step that will further develop Cochrane with the greatest possible transparency to the public. Thus, the present commotion can be regarded in retrospect as perhaps painful, but in any case as a necessary impulse for fruitful further development. The decisive guideline for judgement should be the strict orientation on the objectives and fundamental principles of Cochrane. Scientific rigour, knowledge with minimal bias, maximum trust and consistent safeguarding against interest-driven influence on the evidence must continue to stand above everything else. In the short and medium term, no immediate effects are to be expected for the work in Germany. On the contrary, the activities of Cochrane Deutschland are entering a new era with the successful efforts of the BMG to sustainably support the Cochrane Deutschland Foundation and by the establishment of the Institute for Evidence in Medicine (for Cochrane Deutschland Foundation) at the Medical Faculty of the University of Freiburg. The new leadership of the soon to be filled W3 professorship, will be the final step in significantly improving the working situation for Cochrane in Germany. 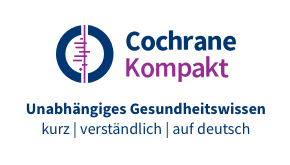 As a result, Cochrane Germany is in a comfortable situation by global comparison, which will enable it to actively support the development of Cochrane International and thus overcome the current irritation.